With 3D movement and Oculus Rift support, Norwegian Activetainment's fitness bike, the "Ebove B\01" (via Prostetic Knowledge), can help put some fun into the rigorous monotony of training. Install some mechanical fans and it's almost like going for a real ride. 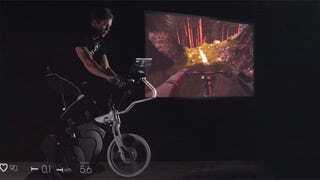 I wouldn't ruin the experience with a generic cycling simulator like the one in the video though—this is perfect for games like Dave Mirra Freestyle BMX, Excite Bike or Crazy Taxi. Here's the whole concept, showing how it works with an Oculus Rift added.